Here is another example of cleaning-out-the-pantry-because-I-want-to-use-it-up cooking. This time, featuring semolina flour! I have another store of semolina flour that I use for making pasta, which is much more yellow and seems to be a larger mill than this much paler flour ; I hadn't used the bag of semolina flour that my hand always passes over in favour of the supposedly fancier Italian pasta durum wheat flour. That is, until now. I had an inkling that some Italian bread may be made from semolina flour, so why couldn't some of my bread. Why not indeed? I think this is one of the nicest, richest, most flavourful breads I have made. It is soft and moist and oh so moreish. Mix the flour with the yeast and enough water to make a shaggy mess. Leave for 10 minutes for the flour to absorb the water. Mix in the salt and add enough water to form a soft and silky dough. 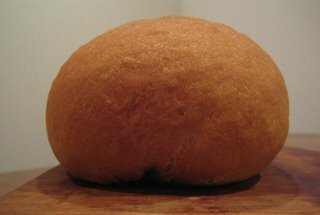 Leave in a warm place for an hour to double in bulk then shape into a loaf* and leave to double in size once again. Bake at 180°C for 25 minutes or until a rap on the bottom sounds hollow. Leave to rest for at least 30 minutes before slicing and enjoying. * Or maybe something else . . . ! wow this looks interesting, I have never tried baking with semolina flour. That is one pretty looking peice of bread. Thanks very much! I really wasn't sure how it would turn out, but it came together rather well.